STAG were sitting together having a chat, and talking about walks past and those that were likely to be in prospect in the future. "Isn't it nice that Dad has added a listing of our 2008 adventures to our website", remarked Tetley. "Yes", agreed Shaun, "but I wonder if there are any more that we can write a story about." Ever eager to expand the site, Allen piped up, "I have been looking at the list and at the photographs on Dad's computer, and think those two walks from Uncle Eric's may be possibilities". "Dad's not about, so shall we all have a look? ", said Grizzly, conspiratorially. Allen is quite an expert operating the computer, so he booted it up ,and then brought up the photographs, saying "what do you think?" "Looks good to me", enthused Tetley. "I agree" said Little Eric who had perched himself on Shaun's back so he could see the screen. "Now all we have to do is convince Dad", said Shaun. It was a rather windy day with heavy showers as we set out from Uncle Eric's , but after about an hour it brightened considerably and the sun came out. It was in fact our first walk for five weeks, since Dad injured his ankle falling near Sour Milk Gill above Grasmere. To test out his recovery he had decided that a level walk was best. Uncle Eric has lived in Kendal for a long time, and so is very conversant with the many paths and tracks. Crossing the road the narrow path between the houses, led over Prickly Fell, and then steeply down to Horncop Lane. After some more street walking, another narrow path brought us beside the River Kent, at Kentrigg. It was full and flowing fast after recent rains. This river is relatively short, starting in the Kentmere Valley, passing through the villages of Staveley and Burneside, before reaching the town of Kendal. Then after a few more miles it empties into Morecambe Bay. It is in fact one of the fastest flowing rivers in Britain, rising extremely quickly after heavy rains, but equally the level soon falls once the rain stops. A few minutes later, a heavy shower passed across ahead of us, this rainbow shining out against the angry black sky. The other rivers we were to encounter today, both flow into the Kent, and after a while we passed the confluence of the Kent and Mint. As we continued alongside the Kent we passed by Carus Green Golf Club. One hole requires teeing off across the river - some water hazard! Eventually along further paths and the road, we reached the village of Burneside. Walking through, passing the large complex of Croppers paper mill, it was then along the narrow quiet road towards Garnett Bridge. We all enjoyed the wonderful and extensive views to the nearby fells, and of the beautiful countryside. Our route now lay along a path to Tenement Farm (now very stylishly converted into dwellings). In a small allotment were two beehives. We stayed well out of range as we did not want to risk being stung! Then coming beside the river Sprint, we arrived at Sprint Mill. The Sprint has its source high on the south facing side of Harter Fell. The first two miles are a series of short flat sections interspersed by spectacular waterfalls. Then it flows through the Longsleddale Valley, eventually joining the river Kent just to the south of Burneside. We had seen some of the waterfalls, on a walk from Sadgill in Longsleddale. After all the rain lately it was certainly sprinting along. A convenient seat, with the view of the river, provided a good place for us all to have our picnic. Before setting off again, we posed for our picture. The seat was rather damp so Dad thoughtfully had let us sit on the map cover. The buildings are now in private ownership, and have not been operated as a mill for some time. This was once the largest mill on the river, having in its time served as a corn mill and later as a woollen mill. Over the centuries eight mills are known to have been developed along the Sprint, using its fast flow for their power. Now with all the emphasis on renewable energy, perhaps the power of these rivers should be harnessed to provide sources of electricity? After crossing the bridge, we dropped down and doubled back, now on the opposite side of the river. Crossing fields we reached the hamlet of Oakbank, where there was once a bobbin mill, built in the 1850's. Burton House Farm was the next objective, reached over more fields, that were very boggy in places. It was here that we encountered the most unusual tea room ever visited by Dad. It is called Billy's. Me and my little sister have pestered my mummy and daddy to get us some pets a little different to my class mates. but there was a problem; how do we pay for the food for our animals?? I thought of this idea as many walkers come through this yard "let's make tea and sell it"!! the money tube on the wall". Enjoy the rest of your walk, have a nice day. We all thought how enterprising - he will go far! There are seats to sit on, tea, coffee, biscuits etc etc. Just super and we loved it. Having scrambled up on to the counter, Allen called out "please take our picture Dad." Dad signed the visitors book, mentioning Uncle Eric and us too. Time now to be on our way and we walked the access track to the A6 road. Crossing this we then made a difficult descent down a bank, through thick vegetation, to reach the gate into the pasture below Chester Hag. This path led to the impressive complex of Skelsmergh Hall. Continuing we passed Dodding Green, the buildings of which are used as a Catholic rehabilitation centre for ex drug addicts. 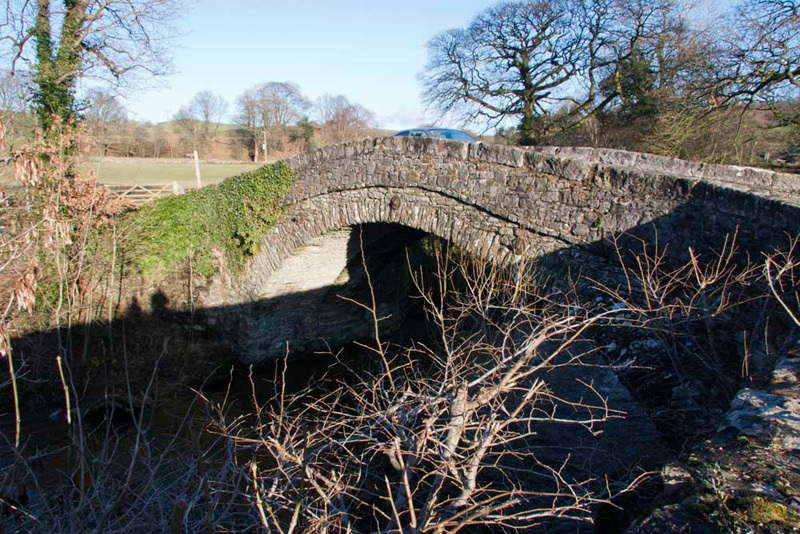 We had now come beside the third of the rivers today the Mint, and we followed the path beside this to Mint Bridge, having to negotiate carefully one particularly wet area. We crossed the road and then continued, but on the other side of the river, skirting the industrial estate to come to the confluence of the Mint and Kent again but on the opposite side . Now following beside the Kent we came to and crossed this suspension bridge. It was once sited over the river on the south side of town at the end of Romney Road. It was moved here, when a road bridge was built on its former site. This was to allow speedier access for ambulances to the new Westmorland General Hospital. From the bridge we followed paths to Burneside Road, and then it was not too far to Uncle Eric's. Dad got changed and then we all went in to Uncle Eric's and rested on his comfortable settee. Dad of course had a nice cup of tea. A very enjoyable and interesting walk, made more so by Uncle Eric's extensive knowledge of the area. Dad said too it was good to be out again, and he had not experienced any problems with his ankle. This was great we thought, especially as on our next walk he took us on the hills. The summit of this fell has only been officially accessible since the CRoW act (Right to Roam). Dad had not climbed it before, so Uncle Eric kindly agreed to visit again and be our guide. We were also excited about reaching this summit as the road that we live on is named after it - Hayfell Ave. The first part was along a myriad of ginnels and paths, so adding to our exploration of Kendal. Some of this we had in fact done before but in the opposite direction, in the walk above, bringing us to Mint Bridge once again. Again we then walked along by the Mint, but in the opposite direction. It was frosty and the ground was hard, and thankfully the very wet area we had experienced in October was dry. Reaching the entrance to Dodding Green we kept on along the road towards Meal Bank, passing these cattle in the frost bound field. At the bridge we crossed the river and continued climbing up the road, but deviating on a path through the woods to ease the gradient. This finally brought us to the main road by the bridge over the railway. Great care was necessary here as the road was covered in ice. The 4x4 that had lost control and was on its side in the trees by the road, was clear evidence of this. Proceeding along the road we arrived at the houses at Toll Bar. Here we turned right on a track that climbed up through pastures to a gate and stile in the wall that gives access to the summits. We say summits as there are in fact two tops divided by a small valley. The whole fell is called Hay Fell, but the summits are called Benson Knott. "Which one are we going to first" enquired Grizzly. "The east one on the left, as it is the highest", replied Uncle Eric. As we reached it Allen remarked, "there is a big cairn." "Yes" agreed Tetley, as we all scrambled on to it. He then called out, "come on Dad take our picture." "What are those hills over there", asked Little Eric. "The Howgills", replied Shaun. "They are worth a photograph too", he went on. "Just look over there to the north", Allen then called out. "What a magnificent view"
"Yes that is the Kentmere Horseshoe, with the Longsleddale Valley, through which flows the River Sprint, to the right", said Tetley. "That's worth a picture too." When Uncle Eric had last been up here it had been raining and the views were totally obscured. Today was a bonus for him, as besides the pictures above, the whole sweep of the view included the Coniston Fells, Crinkle Crags. Langdale Pikes, Bowfell, Esk Pike, Great End, Red Screes, Kentmere Fells, Longsleddale. To the east the Howgills and Baugh Fell, Aye Gill Pike, Middleton Fell, and Whernside. Just magical!! The slightly lower west summit is adorned with a trig point, and distantly to the right are the Coniston Fells. We now walked to this, but not before Dad took this shot to clearly show the valley between the two. 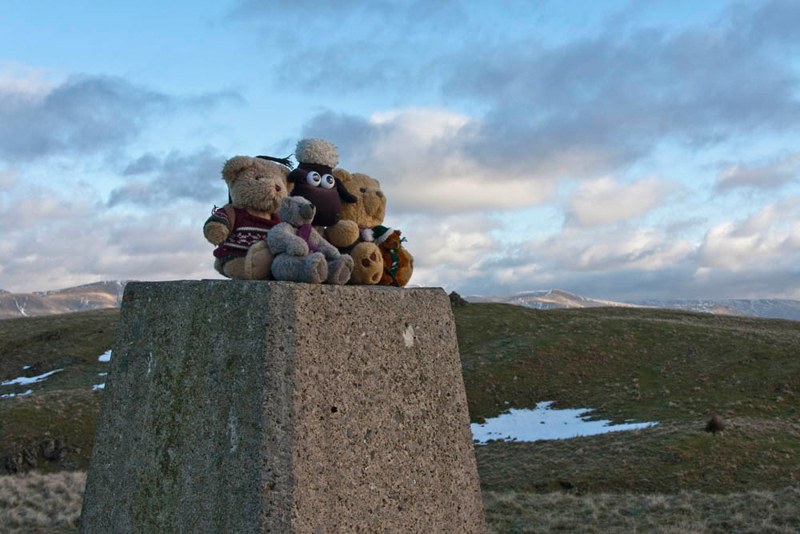 Here Dad took our photo again, that was when Allen had stopped playing the game of jump off the trig point!! After a last lingering look at the views, we now made our descent to the stile we had crossed earlier. Taking a path north and then west we came to another stile, and so to the track we had first walked up from the road. This variation made a nice circular route. We then retraced our steps to Meal Bank, and Dad took this shot of the bridge over the Mint. We again followed the river but this time on the other bank, all the way to Mint Bridge. Before reaching it there was a good opportunity to take a picture of the river. The River Mint has its source in the valley of Bannisdale. This is the next valley north from Longsleddale. The Bannisdale Beck starts high in the fells above Bannisdale Head, and is joined by a smaller stream draining a group of small valleys from headwaters in The Forest, Combs Hollow and Mabbin Crag. It is at this confluence that it becomes the Mint. The only habitation in Bannisdale is Bannisdale Head Farm. The valley is surrounded by hills that form a horseshoe, and is one of the walks in Wainwright's Outlying Fells Book, which we did on 30th August 2006. As Dad got his boots, on the farmer passed by in his tractor leaving the valley. Some hours later when Dad was taking his boots off at the end of the walk the farmer passed by again returning up the valley. One wonders what the chance was of this happening. In the picture, the bridge you can see, carries the pipes of the aqueduct, taking the water from Haweswater and Thirlmere to Manchester. At the road, Morrisons supermarket was nearby, so Uncle Eric and Dad had their lunch at the cafe. We had packed a picnic and munched away while we chatted about the walk so far. Now Uncle Eric took us back via a different route and over the iron bridge that crosses the railway. It is a long bridge and Uncle Eric pointed out where the sidings and goods yard had been, so giving sense to this. Coming out on to Sandes Ave, we then took the riverside path by the Kent to Dockray and so Uncle Eric's house, where Dad had once again parked. After Dad had got his boots off, we all went in, Barnaby, Lee, Grisedale and Ginger too, and settled on Uncle Eric's comfortable settee again. Dad had a warming and welcome up of tea, while he and Uncle Eric chatted. Yet another super day and again, it just goes to show that you do not need to be really high to get great views. Thanks Dad, so much, as always.